A bit of background on CBD first – This is a chemical compound called cannabidiol that is found in different strains of the cannabis plant. 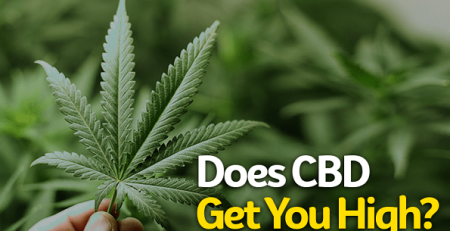 Although if you want it in high number, then strains that are part of the Sativa classification of the cannabis plant family are the ones that have the most CBD. The other classification is Indica, and most of these make you high. This is because the chemical compound found in the Indicas are usually able to make you high. This is because the compound in it called THC (Tetrahydrocannabinol) which is a psychoactive compound while CBD is not. 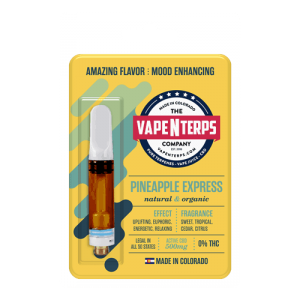 Almost all cannabis strains, for example, the Pineapple Express have different concentrations of CBD and THC. Many times these strains will have both of these in different ratios, and this difference in ratio will primarily determine the effects of the strain. If the THC is high you will obviously get a generous high, and if the CBD is high you will get the health benefits without getting high (THC and CBD essentially have similar benefits, but THC makes you high while CBD does not. THC makes you high means that it is illegal to include in a product (if it is higher than 0.3 percent). This is why nowadays a lot of individuals are buying CBD infused products. Read up on our article detailing both Sativa and Indica classifications! Now that the background is over, we shall dwell on how CBD oil is made, which is the most popular products of CBD infusion ever made. 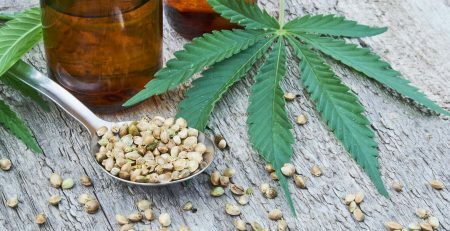 There are two different ways to make CBD oil. We are writing it like instructions so that you can make your own CBD oil. First, there is a need for a carrier oil like the coconut oil or the olive oil. This way the benefits of CBD is used but also the benefits of the oil being used. First what the maker does is also keep bud trimmers or weed grinds to take the buds off. Remember that the quality of bud will determine the quality of oil itself. Once the buds of the cannabis plant (a strain which should have a high concentration of CBD) are down then getting ready for decarboxylation, a process which in which carbon dioxide is released. For this to be done baking the buds that were cut down at 220o Fahrenheit Degrees for around 90 to 100 minutes. When the baking is done then take a mason jar and mix the baked item with the oil that you at first made to be incorporated. Mixing should be done until the mixture itself is saturated. Also, remember that the potency of the end item depends on how much less oil and more CBD you added to the mix. Place the mixture into a boil, and it should be exactly 200o Fahrenheit degrees. Place a towel under the mason jar. Leave it for 3 hours and then check it for time to time to find out if the water has evaporated. If not then keep it there for another 3 hours. When it is done the turn the stove off and leave it like that for the night. When next morning you wake up, your oil will be ready but strain it with a cheesecloth and then squeeze to find the CBD oil dripping. First, put the cut-down weed in ceramic or glass bowl. Pour the alcohol in it and stir it for around 6 minutes. Get a wooden spoon to make the extraction of resin from the now stirred bowl. Now place a straining bag or a sieve to bring the solvent material out of the bowl and once that is done then squeeze the extraction as much as possible. If you think you can extract more oil from the solvent then, by all means, do that. Put the now extracted oil into a double boiler and then boil it until the bubbles start to form. Now you wait until when you see the alcohol begins to evaporate but do not stop cooking until it starts to simmer but lower the heat now. So when the alcohol completely evaporates then stop the heating and then mix it. Now the CBD oil is done being made but do put in a container that has a tight lid so that its effectiveness and quality is not ruined. Here an entire plant was used to extract CBD oil from the said plants but do remember that there is a whole lot of other chemical compounds that came with it. Things like THC(Tetrahydrocannabinol) and different terpenes. This will make the effect you will get from the feel different from what you would typically get. To get CBD oil without these additional chemical compounds that can come with complete plant extraction. Alternatively, you can use isolate CBD which only contains the one and just pure CBD. This way you would not be getting a whole material tagging along from the plant. One can buy isolate CBD from many CBD and Hemp stores online or otherwise. We recommend that you buy this from us as we sell high quality pure or isolate CBD. 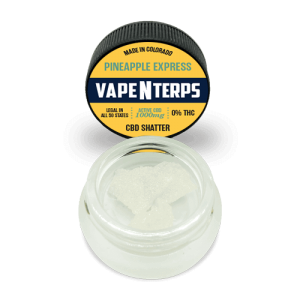 1000mg Pineapple Express PURE CBD Shatter for $54.99!